Ryan Sallans will talk about “Becoming Ryan: Eating Disorder Recovery” at 7 pm on Mon, Feb 5, 2018 in the University Center’s Hamilton Room. 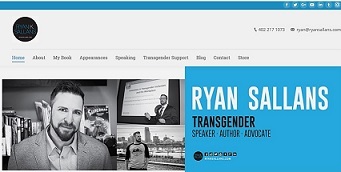 Sallans is a transgender speaker, author, trainer, and advocate who specializes in eating disorders, campus inclusion, and workplace issues impacting the transgender and LGBTQ community. He is the author of the book Second son: Transitioning toward my destiny, love and life (summary at Google Books). Andersen Library has other resources to learn more, including books such as Coming out: An act of love (3rd-floor Main Collection, HQ75.2 .E53 1991), Crossing: A memoir (3rd-floor Main Collection, HQ77.8.M39 A3 1999; preview text available at Google Books), and Black LGBT health in the United States: The intersection of race, gender, and sexual orientation (3rd-floor Main Collection, RA564.9.S49 B53 2017). Please ask a librarian (choose chat or email, phone 262-472-1032, or visit the Reference Desk) if you’d like assistance with finding materials. This entry was posted in campus connection and tagged books, diversity, eating disorders, lectures, sexual identity, speakers, transgender, web sites. Bookmark the permalink.